Mary Jorgensen, 91, of Ideal, SD passed away on Friday, Oct. 5, 2018 at the Winner Regional Healthcare Center in Winner, SD. Mass of Christian Burial was held on Tuesday, Oct. 9, 2018 at 10:30 a.m. at the Immaculate Conception Catholic Church in Winner, SD. Burial will followed in the Winner City Cemetery. A visitation was held on Monday, Oct. 8, 2018 from 6-7 p.m. at the Immaculate Conception Catholic Church with a rosary beginning at 7 p.m.
Mary was born on July 22nd, 1927 in the family home of her parents, Leonard and Mabel Storms. She was named after the Catholic Daughters Court Mary Imelda. She was the youngest of eight children. Her mother died when Mary was only six years old. Mary was raised by her siblings and always said that she was “loved but spoiled”. 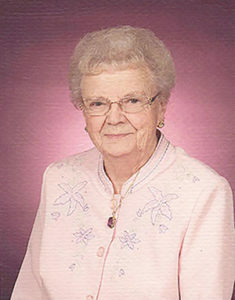 She attended elementary school at the Clearview School in Clearfield and graduated from Winner High School in 1945. After high school, she worked at the Tripp County Auditor’s Office until July of 1946. On July 27, 1946, she married Martin Jorgensen Jr. at Immaculate Conception Catholic Church in Winner. For 72 years, she and Martin worked side by side to raise a thriving family and grow a successful business. While neither would ever claim to have a perfect marriage, the unending loyalty and love they had for each other was obvious to anyone who was blessed to spend time around them. They moved to the family farm in Ideal after they were married. Recognized as a pillar of the Ideal community, she was actively involved as a leader in 4-H, the South Dakota Cattle Women’s Association and the Ideal school. From their home on the family farm, where they lived almost the entirety of their marriage, they raised four children: Judy, Jean, Greg, and Bryan. From that same home, the two fed many employees their daily lunches and hosted many business colleagues who traveled from near and far to discuss the cattle business. Mary was always a gracious host to all who entered her home. She enjoyed gardening, canning, playing cards, and embroidery. Never one to turn down a good party, she always made time to raise a glass for a good toast. She had a sense of humor that was quick and witty, and always appreciated a colorful joke. Mary also had a deep appreciation for family history, and one of the great gifts she left with us is her family albums. These albums were given to many family members, and they went into to great detail about both the Storms and Jorgensen families. The task of researching and compiling these substantial genealogies required great patience, which Mary most certainly had. Mary was known to many in both the family and the greater community as a bright, caring, loving, and kind woman. She handled any situation placed in front of her with grace and dignity. She was also known for her strong faith in Christ and involvement in the Catholic Church, including being a 71-year member of the Catholic Daughters Court Mary Imelda. It was with this unshakeable faith, and practically unshakable patience, that she was able to guide Martin as they built their lives and continued to guide many members of her family through theirs as well. Often referred to as “the rock” of our family, her ability to handle great adversity came from her strong relationship with Christ, which was one to be admired. While she will be greatly missed by all who knew her, Mary would want to remind us all that this need not be a sorrowful time. Now is a time for celebration, because while her journey here may have reached its end, she has entered another journey in the embrace of Christ. She is survived by her husband of 72 years, Martin Jorgensen Jr. Four children, Judy (Tom) Peschio, Jean (Gary) Davis, Greg (Deb) Jorgensen, and Bryan (Brenda) Jorgensen. Sisters-in-law Ruth O’Keefe and Leona Storms. Seventeen grandchildren, twenty-nine great grandchildren, and numerous relatives. She is preceded in death by her parents, her siblings Clara Frank, Mamie Crane, Gen Fast, Leo Storms, Donald Storms, Emerald Diez, and Cecilia (Johnny) Kartak.